This year keeps adding to its own uniqueness. Every year on a farm is different, and like the weather, it is endlessly fun to look at and talk about those differences. September has brought us orange pumpkins on Labor day and hot weather to go with it, and now it’s a late frost with tomatoes and peppers coasting into October. We keep expecting the share size to go down, we know it’s been too much for some of you. but this farm keeps cranking out more food for you. The temperature dipped down to 35 or so a couple nights, but then coming back up to nighttime temps in the 50s it’s like that particular f-word never made it in the dictionary. The plants just keep on a-going. The tomatoes and peppers keep ripening, Erin keeps finding new heads in the broccoli and cauliflower, and the spinach has rebounded decently well from the heat wave. So many peppers have turned red that it actually looks like a finite amount of fruit hanging on the plants, instead of the dense clusters that there were a month ago. Thank you for sharing in the risks and rewards of farming with us. This is a year when, having supported us with a set payment to spread the risks of all the conditions that can cause a poor harvest, you have reaped the rewards of a bountiful productive season. We keep thinking of last year, and how the share size and selection was often smaller than we wanted it to be and how that bothered us, and how fortunate we are to have your support. 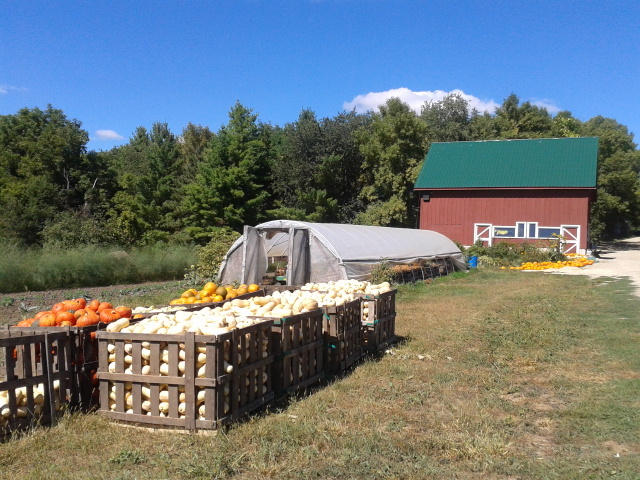 It is your community support that keeps this farm going, here to provide great food for the coming years. And this year, it is pure pleasure, surfing a giant gentle sloping wave of good harvests. It’s taking a smidgen of wisdom, strength and stamina to steer the boat, but the harvests and fields really feel like they have a powerful momentum of their own right now. We hope you’ve enjoyed it to, and will join us for another year of mystery ride of farming and eating together. That momentum is a combination of plant power and people power. We have been touched lately by the sense that the farm family is growing bigger, and stronger, and deeper. From the beginning 8 years ago, when family members planted our first garlic crop while we finished up a farming season for our mentor farmer in Massachusetts, we have benefited from a long long list of generous favors from generous people. This year with around 200 families enjoying the farm, a stellar crew of skilled, experienced and dedicated employees, an extended crew of friends and family pitching in when it’s needed, and good working relationships with the Northfield Food Shelf, Just Food and both colleges, and so many neighboring small organic and sustainable farmers, new and old — all these generous people, excited to eat well and be sharing it with others, this is powerful. Together, we are all improving the world, and when we think about the troubles of modern food, we know we are turning food culture towards more wholeness, health, and justice, and better flavor! This is a community-supported farm, and here’s a story of one of the countless behind the scenes community supports, which happened the other night. You all saw the bins of winter squash lining the driveway the last couple weeks. We loved their beauty and bounty being on display there, but it really isn’t an ideal storage place — the tarp needs to be pulled on before rain and off before sun, blankets need to be put on before cold and off before heat, and when the tarp is on it’s a wet humid environment, which all adds up to a high maintenance situation not good for keeping squash solid and healthy. The greenhouse is much better — dry, good air flow from the fans, warmer at night, and almost zero daily maintenance. But you might remember the greenhouse was filled with that awesome onion crop. So we finally had a chance to get the onions cut and haul out the pallets and cinder blocks they were curing on. The next step, rolling the bins into the greenhouse is currently a 2-3 person job, pushing a pallet jack uphill with 1,000 lbs of squash. (This is one infrastructure problem we hope to address this fall/winter, with a new greenhouse.) We tried our best but didn’t get it done on Friday afternoon, and wanting to see it get done, two friends, Jesse and Nate, offered to come later in the evening and help push them in. Jesse works part-time with us and we wish he’d stay forever. Nate is an old friend who recently bought a farm to start a hard cider business, you’ll hear more about this in the coming year. They brought their families after dinner, and we spent an hour and a half pushing bins in, until well after dark. Skye (Jesse and Shahar’s 3-year-old) helped pump the handle to lift the bin up with the pallet jack — of course Ben can be impatient and the pumping goes a little faster if you lift up a little higher, so with each pump Skye’s feet would leave the ground and nearly pull his arm out of its socket, and he loved it! We were cheering him on, and as he helped pushed the first bin in, Tristan (Nate and Tracy’s 2 year-old) was bauling cuz he was left behind. So Tristan got to pull the handle to lower the bin back to the ground. All evening the little ones were tromping around, and we kept them here far past their toddler bedtimes. Thanks for all your support, in all its forms, and as always let us know how we can serve you better. With warm weather and no frost in the forecast we’ll keep getting to revel in the summer/fall overlap. We’ll probably lose summer squash, zucchini and cucumbers, to their usual fall decline from age, disease and those two or three cold nights. You’ve probably noticed they’ve been looking a little funky. Other than that we’ll just be adding crops to the mix. Sweet potatoes are ready. There are still a lot waiting to be dug, maybe they’re getting bigger in there, but we picked a couple beds and cured them so we could get you started eating them now. This week will be the culls that won’t store well — some that were cut or damaged in the harvest, and some that were “peeled” by an accidental trip through the root washer. They were mistaken for a bag of carrots, and with so much mud on them it wasn’t evident until the skins were already gone! Eat these asap. By next week we should be on to better quality ones that can be stored as desired. For winter squash, the butternuts are approaching full flavor, so they’ll get tossed in the mix with buttercups and spaghettis. The acorn and carnival will be available too, in the white bag and/or separate with the big squashes. Delicata is ready too. Please eat delicata, acorn and carnival soon. Eat delicata this week. They are not great keepers. The buttercups and ambercups can usually store, but ours should be eaten soon. Those varieties are awesome to eat but susceptible to some unknown rot on this farm. Butternuts and pie pumpkins are the best keepers we’ve got. (Butternuts are long with a bell-end and tan; Buttercups are round and green, with a “beanie” and a “nubbin.” Ambercups are round bright orange, and will be ready soon.) We sort very carefully for good flavor and soundness, but if you ever get a rotten squash (sometimes it is hard to tell if they are rotten), just let us know and we will give you another one. Basic squash cooking: Method #1 : Cut in half, carefully with a sturdy sharp knife, scoop out seeds, place upside down on lightly oiled pan for 45-60 minutes at 350 degrees. Method #2: Cut in half, scoop out seeds, peel with knife, and cube. Boil, roast or microwave until tender. There must be other ways but these are the most common place to start. Once squash is tender, it can go anywhere. Okay, not anywhere, but where can’t you put a sweet-tasting, hearty-feeling and smooth-textured delicacy? We love to eat them as is out of the oven; or mixed with butter and maybe sage, replacing pumpkin in a pumpkin pie, layered in a lasagna or at the bottom of an egg bake, in a coconut milk curry or other curry, or in a cheese sauce with pasta (especially in Zippy Cheese Sauce with garlic and hot peppers, p 92 of The Moosewood Cookbook.) The list goes on. We’ll keep extra cooked squash in the fridge and they always find a home. And honestly, if we let one go by in the fridge our dog loves it too, and she’s actually gotten as picky as us. If they’re not at peak flavor, she won’t eat ones we cooked when trialing to find out which ones are ready (those go to the chickens.) We hope you love squash as much as we do, and if you don’t yet, try it out, because there’s lots coming, and your farmers say it’s good for you! Spinach will be around at least a couple more weeks, and hopefully all month. We’re into the third planting now, it was quite young in the heat wave and has been looking better. After this week we’ll be cutting all the plantings for the second time. We call it “re-cut” and re-cut can be a little rougher around the edges, and sometimes has more yellow leaves. We do some sorting, but you may want to look it over if you don’t already. It is already a little sweeter, it must have responded to those cold nights. Celeriac is back. Celery is done now, and this keeps the celery flavor alive in our kitchens. also know as celery root, it is the same species, but bred for the usable root rather than the stalks. It will store forever in the fridge. It is sometimes used raw, but most often cooked to start a soup, with onions or leeks as you would with celery stalks. The other common way is as an additive to mashed potatoes–note that it takes +/- 10 minutes more than potatoes to soften, so put it in the water first. To peel: cut in half, and use a sharp knife to slice the green outer skin off. Cube the remaining white/grey flesh. It’s flavor also leeks throughout a dish. Everything else should still be going well. Parsnips and brussels sprouts we’ll wait til the last couple weeks of October, if there hasn’t been a frost or better yet a 28 degree night, they won’t be as sweet as possible. But they’re yours so we’ll pick them then. no matter how warm/cold it is. Raspberry fruit fly pressure is almost non-existent so if you’ve been avoiding them now’s the time to dig in. We may have to lower the limit as there is plenty still to ripen, but coming slow in the (mostly) cool nights. This week’s selection is : Garlic for $1 / head, Lettuce Mix for $5 / lb, Carrots and Beets for $1 / lb, Cabbage for $.50 / lb. Bulk tomato boxes, seconds, 12 lb for $18 or firsts, 12 lb for $24. Green and Red Peppers for $2/lb. Winter squash, most varieties, $.75 / lb. Garlic can always be purchased in the barn, no need to pre-order. Sogn Valley Craft Fair this Saturday and Sunday October 5th and 6th!!!!!! Click on http://sognvalleyartfair.com/ for more info and directions, or pick up a postcard in the barn. This is the 41st Annual, a beautiful fall tradition on a farm in Cannon Falls, with superb artists and craftspeople plus farmers (like us on Saturday and our friends and neighbors Andrew and Betsy of Spring Wind Farm on Sunday), and food booths too. Last Share Pickups are Monday October 28th and Wednesday October 30th. We will not be doing Friday pickup that week. Friday people please sign up via email or in person for Monday or Wednesday of that week, or if you can’t make it those days we will happily save a share aside for you to pick up another time. We apologize for any inconvenience this may cause; we’re trying it out to help us get a jump on putting the farm to bed and harvesting the last carrots, beets, celeriac etc for the storage share. Thanks for helping! This week we’ll be handing out renewal letters with info about signing up for next year. We hope you’ll come around again, and as always let us know what you think. For potatoes for sale this fall, we’ve got Adirondack Red and Carollas. The Adirondack Reds are red on the inside too! The Carollas are similar to Yukon Gold. The potatoes are coming from our friends’ farm 5 miles north of here, Fazenda Boa Terra. Their web site can be found here. They grow organically but their potatoes are transitional this year, due to a new field that they are farming on. Each 5 pound bag will be $6. Peel the onion and garlic, and slice thin. Peel the carrot and dice fine. In a large pot, stew the onion, garlic, and carrot in the olive oil, covered, until soft and translucent. Add the chicken stock, bring to a boil, and simmer uncovered for about 15 minutes. Prepare a large bowl half filled with ice, and a smaller bowl, preferably stainless steel, that will fit inside it and rest on the ice. Wash the parsley and spinach and add them to the pot with the chicken stock and other vegetables. Shut off the heat and allow the soup to stand, uncovered, for 5 minutes, no longer. Immediately purée the soup in a blender and pour it though a medium0mesh strainer into the bowl in the ice bath. Stir the soup slowly with a spoon or spatula until it has cooled to room temperature and then remove it from the ice. Quick cooling preserves the color of the soup. Chop enough tarragon to make about 1 tablespoon and stir it into the crème fraîche. To serve the soup, reheat it to just below a boil and garnish each bowl with a teaspoon of the crème fraîche.